The morning was my final run before the marathon training plan starts. I woke early, 5.40am to be precise, and quickly realised I wasn’t going to get back to sleep. A combination of beautiful sunshine outside and the awful news of another terrorist attack in London put paid to that. And so an hour later, at 6.40am, I found myself stepping out the door for an 11 mile run. Today I was trying something different – eating & drinking on my run. After 10 years racing a bike, my body is used to training fasted. It’s a good way to teach your body to burn fat. So when I started running, I simply did what I was used to – get up, kit on and out the door. However, it only recently dawned on me that when I went out on the bike, I’d always have a couple of water bottles with me so that I could stay hydrated. Now, on a short run under an hour not having water isn’t a big deal, but as my runs have got longer I’d realised that this was perhaps not the best plan. Was it affecting my performance? So yesterday I popped in to see the guys at Run 4 It, our local running shop. The staff there are all runners, and they know what they’re talking about, so I found myself chatting with Douglas about the different options for nutrition & hydration on the run. 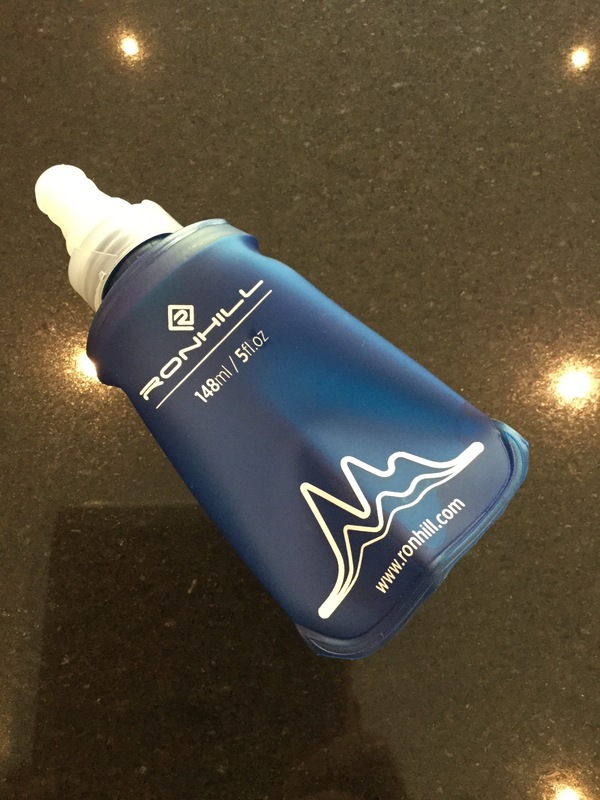 I left the shop with a couple of very cool little bottles made by Ronhill – like mini Camelbacks that you can carry on the run, along with some Torq energy drink powder & gels. This is the smaller bottle, which will be ideal for hard interval sessions. Today on my long run I look the 238ml one, along with a gel. Other than in races, I’ve never used anything when I run, so I was keen to see what difference they made. Boy was I glad I took them out with me! It was sunny my whole run (I was out for around 1hr 40 mins) and the temperature was up around 14C. I sipped at the bottle, which I’d made up with weak SIS Energy drink, and took the gel around mile 8. I felt the benefit of both, and cruised the final few miles home. I was tired, but could have comfortably done another 15 mins, which would have taken me to half marathon distance. So with the marathon training starting this week, and the long runs building up over the summer, I’m definitely going to be taking water & gels out with me. If nothing else, it will get my body used to them for the main event in September. It’s been another hay fever affected training week. I felt great on Tuesday, when I was doing 1 minute intervals, then terrible on Wednesday & Thursday. I actually went out on the bike on Wednesday as my breathing was so bad. Yesterday’s easy run felt better, and today better again, so hopefully we’re getting over the worst of it now. I feel ready, and excited to start the marathon plan, which begins after a rest day tomorrow with an easy 35 minute run on Tuesday followed by 30 mins in the gym. Good reminder for me, I need to start experimenting with the gels as well! Thanks! Water and fuel definitely make a difference on long runs! I’m not a big fan of gel texture. I prefer sports beans (basically glorified jelly beans) because who doesn’t want to reward themselves with candy on a run. Also, I like SaltStick fastchews for when I need more electrolytes but already have enough carbs. The are fast melting tablets that only contain electrolytes, so you can stay hydrated without over fueling on carbs.